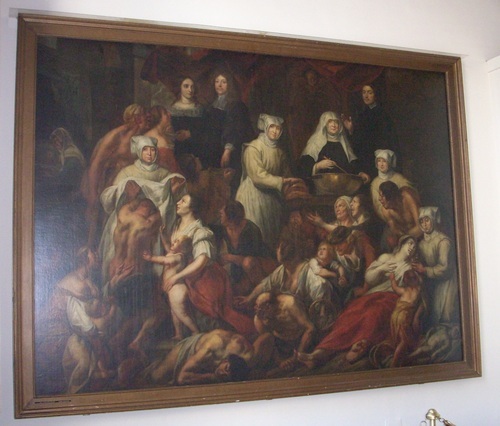 This big oil on canvas of 17th century by Flemish painter Jacob Jordaens represents the works of mercy by the nuns who were in charge of the Gasthuis St Elisabeth in Antwerp and can be seen on a wall of the ancient ward of the hospital1. 1. See L.De Haes-A.Knockx, The Old Hospital on the Elzenveld - Alderfield - Socio-Cultural Centre - Congresscentre, Hospital of Saint Elisabeth - Antwerp s.d. [1992? ], pp. 25 and 41.